But both brush aside any questions about the possibility of Clinton succeeding the president in the 2016 elections. WASHINGTON – President Obama lauded Secretary of State Hillary Rodham Clinton as one of his closest advisers and said their shared vision for America’s role in the world persuaded his one-time rival — and potential successor — to be his top diplomat while he dealt with the shattered economy at home. 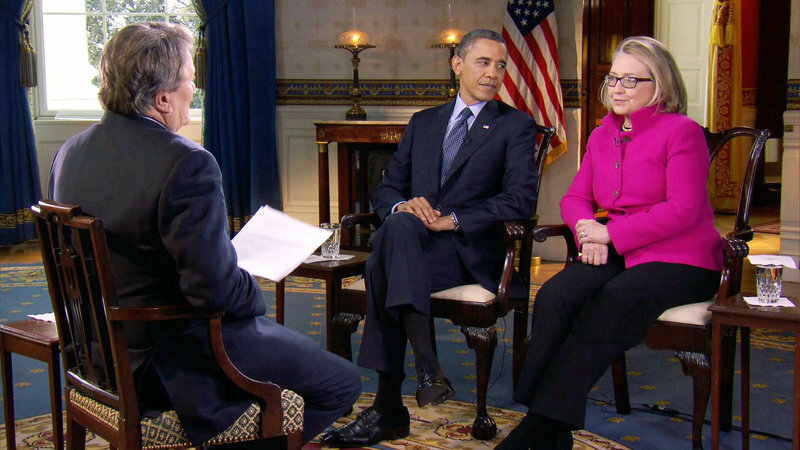 During a joint interview that aired Sunday on “60 Minutes,” Obama and Clinton chuckled as they described their partnership and stoked speculation that Obama may prefer Clinton to succeed him in the White House after the 2016 elections. Clinton is leaving Obama’s Cabinet soon, and speculation about the former first lady and senator has only grown more intense after a heated appearance last week on Capitol Hill. Both Obama and Clinton batted away questions about future campaigns, but the joint interview — the president’s first with anyone other than first lady Michelle Obama — was only likely to increase the fascination with Clinton’s future. It teetered on an endorsement of a 2016 presidential bid that is still an open question. Clinton advisers say she has not made a decision about a run, while Democratic officials suggest Clinton would be an early favorite if she decided to mount another campaign. Obama and Clinton laughed when asked about the political future. The possibility of a presidential campaign for Vice President Joe Biden did not come up during the interview, taped Friday at the White House. Obama described why he insisted Clinton become his secretary of state. It was a job she initially refused. But Obama kept pushing, Clinton said. It’s a job she embraced during the last four years. She arrived on the job with a global brand she quickly lent to promoting U.S. interests. In return, the public rewarded her with high approval ratings that could come in handy if she runs in 2016. But her tenure has had its blemishes. For example, the United States did not directly intervene in the civil war in Syria, where the United Nations says more than 60,000 people have been killed and more than 2 million people have been internally displaced since the start of the conflict in March 2011. “There are transitions and transformations taking place all around the world. We are not going to be able to control every aspect of every transition and transformation,” Obama said, saying his jobs are to protect the United States and engage where the United States can make a difference. On “60 Minutes,” he praised Clinton’s State Department for helping him sort out what the United States can — and cannot — accomplish. “It has been a great collaboration over the last four years. I’m going to miss her. Wish she was sticking around. But she has logged in so many miles, I can’t begrudge her wanting to take it easy for a little bit,” Obama said. Obama now jokes about the rivalry: “Made for tough debates, by the way, because we could never figure out what we were different on,” the president said.